Collecting seashells along Long Beach Island is fun all year round. The fun does not last long though if you don’t know how to clean them and care for them. The fun will start to stink, quickly. Here are some suggestions on the best ways to clean seashells. The moon shell (street name: shark eye, home of the moon snail) is a top shelf find on Long Beach Island. Any LBI shell collector values a good moon shell, so let’s use that as our example shell. If an actual moon snail is living in the shell it is obvious. Also, you would pretty lucky to see one of these elusive creatures washed up the shore (unless you were here for Mussel City) so we’ll skip that. More likely you will find one of these. Moon Shells, now with more snail! Now, before we continue, take a moment to dig deep and find that line inside you that will define which creatures it is OK to “relocate” or kill and which it is not. I suppose that is a personal decision. Personally, I will clean a moon snail of attached mussels, but if it has slipper shells inside I will throw it back. It’s extremely uncool to kill hermit crabs. One thing that I don’t consider debatable: if you find a live moon snail please put it back in the ocean. So, once you are ethically clear that you have a keeper, bang the shell in your hand to make sure it’s empty. Shake it. Rub. Smack it up, flip it, rub it down, oh no, and then rinse it vigorously in the ocean until you are sure it is empty. If you are the type of person who kills mussels, make sure you get them all out of there before you put it in your pocket. Don’t forget to smell your shells! Your nose will tell you a lot. It’s OK and natural for seashells to smell a bit like the ocean, but if they smell like death, throw them back. Don’t bleach sea shells. Bleaching your seashells is not necessary. You will destroy the color and your shells will forever reek of bleach. Put them in a big pot or bucket and let the water work its magic. Periodically flush the water. If you are really into it, change or flush the water once a day. In just a few days you will notice the difference. Ahhh, the miracles of nature. When your all done, boil them. That’ll kill whatever is left in there. After letting the shells dry thoroughly they will probably look a bit dull & faded. You will start asking yourself, “why did I pick that dull, lifeless seashell in the first place?” They just faded a bit. We’ll get the shine back in Step 5, but for now, let’s make them look worse with sandpaper. Take some coarse sandpaper and rough up the shell. Use the sandpaper to remove depositis and gunk, but also give the whole shell a good roughing up. That’s it. If you are as obsessive-compulsive and germaphobic as my family is, then you are a happy Long Beach Islander with clean, eco-freindly shells that look great and will last a lifetime. Best of all, you just found a great project for the kids. Enjoy and good luck making them shine. Do i do the same with shells for hermit crabs? what grit sandpaper do u use? I’m just reading your post after a trip to San Diego where my 4-1/2 year old went to town on shell collecting. We’re from Colorado so, yeah — not many shells here. 🙂 Thanks! Fantastic! I’m glad the page could be of some service. How do I get the sand out? I keep my shells in a bottle and would like to add a liquid – was thinking a water and bicarb solution – would this work or make them rot? I have already cleaned all. Dude. Are u serious? Seashells come from the ocean . They don’t rot . Dude…don’t put them in an aquarium or they will rot away to nothing! I’m, watered down acrylic paint . Or thinned with acrylic painting medium. Get creative . There’s no one answer to that. Thanks for the great info! I collected a bunch of shells on LBI this weekend and noticed the were dull after soaking. I googled for help and found your blog. Your photos are gorgeous. Thank you very much for sharing! I’m gonna get some sandpaper and mineral oil and get to work! My moon snail shells seem to have a thick coating of white mineral over the shell. Do you know of a way to remove that so the pretty shell beneath shows? Perfect, did NOT want to use bleach, and of the 5-6 guides I opened after googling, yours was the only one that didn’t. Thank you so much! Great! Bleach is totally useless. It’s amazing what fresh water + patience can do. I have to say that I agree with the informaation provided here. this area. Nice read – thanks for sharing. Thanks for this info. So many say to use bleach & water..DONT! I did now I’m trying to get them all shiny again. My Shells that were faded & dull with a film over them for 4 yrs. now look GREAT! Dont think twice about using sandpaper..it & the mineral oil did a great job. how do you get the smell of dead animals out of your shell. I agree with Chetna, if it does not work use vinegar. I am in the process of trying your technique out (Step 1 actually). I totally agree with you, patience often receives the best reward – I was about to use the bleach but after further research I came across your advice and I want to do it right the first time around. I’ll try to remember to update this post to let everyone know how it went. I can’t wait to see the results – first shelling experience and I found a wonderful button shell! is it applicable for the golden apple snail? I wouldn’t take any animals out of a shell. That is there home and they have the right to live there. Taking them out and killing them is like a home intruder shooting someone. I agree, that is very cruel. so you don’t eat sea food? clams, scallops, conch, etc. I picked up some live conch in Florida last week and, evicted every one of them! let me say – they tasted rather good – first time I ever tried them. I am now in the process of cleaning their homes, and they will be a reminder of the long walks on the beach, and tasty meal. Don’t let the “Haters” get to you. Obviously, they have ZERO appreciation for FRESH SEAFOOD!!! Extremely difficult, mean, rude, foul mouthed, EGO maniacs, licesened to drive at Wal-Mart or Kmart Blue Light specials and keep us locals or as we’re truly called “Crackers” from being able to get a table at local restaurants. A person actually born in Florida or has lived in Florida, Full-time, for more than 20 years…..my entire family being the 1st definition. Snowbirds “APPEAR/ARRIVE” beginning usually after Halloween and will exist here until roughly around Easter. The Snowbirds are self righteous people who honestly feel as if it’s because of them, we Floridians have a home and place to work!!! Don’t think I could afford my home, Lincoln MIX, send my daughter to a 4 year University to obtain her Master’s Degree in Psychology in less than the usual 6 years….she did it in 4 1/2. Now on to her Doctorial…..shes only 22. From what you state, you sound as if you would fall into the other 3% of the Snowbirds showing up with wonderful attitudes, extremely friendly to the Locals/Crackers, say “Please” and “Thank you,” and come here to escape the 97% of our Northern Friends who have no Morals, dignity, self control and make Right Turns from the Left Lane and Vice Versa…..let’s not forget the ones who stop, DEAD IN THE MIDDLE OF AN INTETSECTION, LOOKING AS IF THEY’VE FORGOTTEN WHAT STATE, MUCH LESS WHAT PLANET THEY’RE ON!!! Finally, I’ll get off my Soap Box now, if you are a Snowbird, PLEASE DO COME. PLEASE be aware of your surroundings and most of all, ENJOY THE FOOD YOU’VE PICKED FROM THE BEACH!!!! Remember to be kind, say “Please,” “Thank you,” and as all of us Floridians say, “Come back when you can’t stay sooooooo long. We like to go out for dinner too!!!!! Everything I have stated is TRULY meant as GOOD HEARTED FUN!!!!! We all just enjoy making fun of our NORTHERN FRIENDS and really do hope you enjoy your stay. Try the Coconut Grouper…..some of the most incredible Seafood you will ever taste!!!! Will this make them hermit crab safe? I need to make sure that the shells are safe for my little babies, and all the pet stores that are around me only sell painted shells, and the craft stores sell their shells for a very high price. I mean for land hermit crabs. I have Caribbean land hermit crabs. Really, really, really clean them so you don’t introduce disease. What would soaking them in vinegar do? Dissolve them. Leave an egg to soak in vinegar to see what it does to shells. DO not use vinegar, I collected some beautiful Tiger Cowrie shells and after soaking them overnight in white vinegar, it literally dissolved the glossy outer coating. Ruined them….. I collected miniature shells on the trash line on Sanibel Island. You can collect as many as you want and have room in your suitcase to take them home. Too many and too small to sand and apply mineral oil so I sprayed them with acrylic clear coat. It restores the shine and beauty of the shell. They will look lovely in the ship shaped wine bottle we had with our Thanksgiving dinner. Wow!! I have just come across this site and the information on cleaning shells is brilliant. 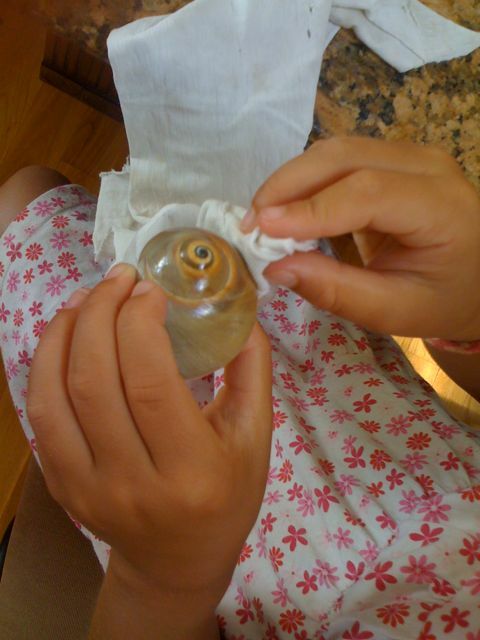 My daughter and I collected some beautiful shells but I was unsure how to clean them as some recommend bleach, others don’t. Can’t wait till shop’s open, (It’s Sunday) to get started. I want to use them for crafting to help raise money for our Scout Explorers, (7th St Georges) to complete their Gold- D 0f E and Young Leaders awards. A BIG thanks. I have lots of shells I got from holiday have been washed and dryed and don’t really smell so is there any need to boil them before I sand them please ?? Leave them in fresh water for a week, and do some googling on the health hazards of sanding shells! Why do you use Sand paper ? I am also curious as to how long to boil? We accidentally ended up with a live hermit crab-in-conch shell after checking extensively (even held it up to light to look for shadows) . He kinda survived 3 days out of water and a flight back to the states. Any suggestions on what to do with the little guy? I think freezing might be the nicest way to kill it? If anyone is wondering, Mr Hermit died peacefully from hypothermia, and a garden hose was enough water pressure to knock him out of the shell once thawed. Poor fella! Good work dealing humanely with him. Maybe you should check better next time. There is nothing humane about what you did. I found some moon snail shells and have not cleaned them yet, is there any possibility a hermit crab could be living inside one? I checkrd as best as I could it’s been about a day. I wondered if baby oil would work also? I have many cone shells with sand stuck in them. How do I get the sand out?? Thank you for these tips! I had some really scummy scallop shells and this worked beautifully. Everyone is clean and vibrant now without smelling like beach! I wish I could pay a picture. do you soak in mineral oil? i have left my shells soaking in mineral oil for a couple days now. also what’ do you suggest i use to rub the mineral oil off? Is using sandpaper essential? I have many small shells and it seems so tedious…..and i don’t think they look much different after. I have a TON of shells I have collected over several vacations. Some are several months old, other a few years. I always soaked them in water for a few days then dried them when I found them before storing them in plastic bags. Now they stink. REALLY bad. What do you reccomend for shells (and a few starfish that I found dried out) in terms of getting rid of the stench before I go on to restore their shine? I need to know how to clean queen conch shells found in Turks and Caicos and keep the color and clean them at the same time thanks!!! Collected shells for the first time at Marco island some very colorful ones and I also 5 conches with pretty shades of brown, to clean them we soaked them in vinegar all night and yikes that was a mistake! They faded! Chalky white! Thinking maybe the mineral oil you talked about or silicone spray. Comments? Will boiling sea shells in clean water hurt them i want to use the pointy shells to make stars with them but the holes are so tiny that you can’t get the sand and dead critters out of them? To remove the calcium deposits from shells. In a glass jar mix equal parts of muriatic acid and water. Use metal tongs and dip the shell in it for a count of 3 , 5 for heavily coated shells. Be careful because this acid will eat the entire shell, after you take it out rinse it in plain water and let it dry, bring them in the house wash in soap and water let them dry. Now that all the calcium which is the whitish he’s you see over your pretty shells is gone you can rub them with the oil to make the natural colors come out or spray them with a clear coat .you can find the video on youtube of how to clean seashells she gives a nice demonstration of how to use this acid safely. I’ve done it with most of my sea shells and I’m a collector. How much does the dremel cost and where can I purchase one along with the diamond tip? Do not do. Dremeling shells is super dangerous. The calcium dust produced can absolutely destroy your lungs. When putting them in fresh water is it best to put the lid on or keep it off? When placing them in fresh water is it best to keep the lid on or off? 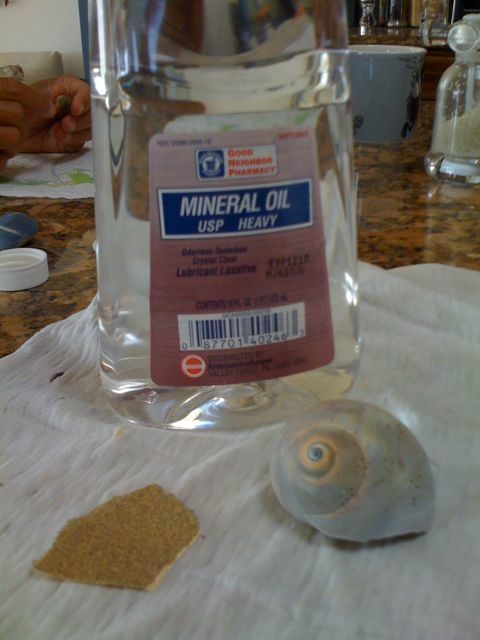 How long should I keep the shells in mineral oil? Put the oil on a rag and rub it into the shell. Dont soak them in oil, that would be a huge waste of oil. I used this method and it really works! My shells are gorgeous! what grid of sandpaper to you use? I collected a bunch of tiny muscle shells from a river. They are beautiful inside, most of them purple, a couple a lovely pearly color. None of them were occupied, all open, most in half. I’m thinking sand paper wouldn’t be good for the inside of the shell. I’m currently soaking them, but wondering if that alone will get the calcium deposits off the inside of some of them. Thank you for your info re: cleaning w/o needing bleach. My Conch shell is in water soaking. My husband got it from a vendor on the beach on our vacation and it still had a bad smell even after a wash out with bleach, then filling it up with hand disinfectant and soaking overnight. Then when home rinsed out with hydrogen peroxide then rubbing alcohol (whatever I had on hand). Have had it out in the sun, but will soak, then more sun :). Thanks again. Your husband BOUGHT a conch shell? Loosen one bite ? Wtf are you talking about? Soaking them is to clean the shell a bit before boiling. Also, in those unfortunate cases when we pick up a shell that has an occupant, they will did in the fresh water and come out of the shell enough to be removed . Would soaking in denture cleaner work? After reading all of the posts, I am wondering about the use of sandpaper. Should it be used on the shells or not? You shouldn’t use sandpaper. My wife has been begging me to update this post to remove that part, for years. It just dries them out. Mineral oil restores the color and then some. I was told vinegar would help from a sheel collecting friend, but now all my shells look as if a white dusty film has been placed and wont come off. Should I try your steps or do I jave to use another route? I just want to say thank you! I have always collected shells on our trips to the coast but have never found a way to clean and Preserve my shells (resulting in tossing them out). This method is easy with fantastic results! So again I say….. Thank you. This has been a Very entertaining and informative discussion. Thank All of y’all for the tips and giggles. I was wondering if a drummel is the best way to go to put holes in the shell to make windchemes and other projects. I use a dremel and diamond bit. You need to have the shell and tip of bit submerged in water during the drilling . And go slow ish. I pick up a shell, if I don’t see anything in the shell I GENTLY shake it to make sure I don’t see anything in the shell. If there is something in the shell, I will put it back into the water. Catalina island. Picked up a shell. Didn’t see anything as I was carrying it around, some juice leaked out onto my hands. Smells like death. And now I can’t get it off my hands. Any tips? IF the shells are smooth, do I still need to sand them? I want to bake coquille St Jacques in shells I have had for years, when I got them I cleaned them like you said but I also put some bleach in the water. Is it safe to bake in them?